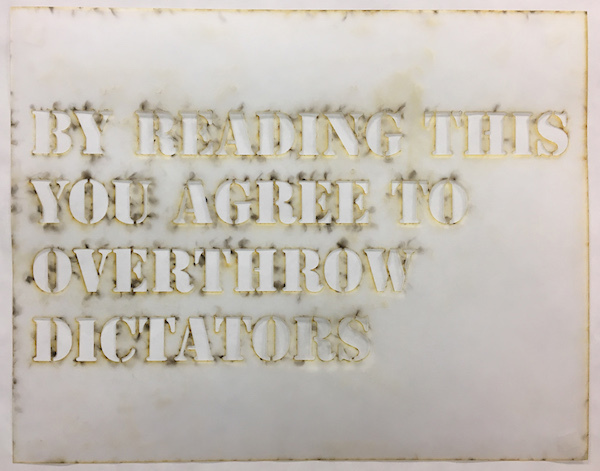 Dread Scott, Overthrow Dictators, 2017. Courtesy of the artist. On Nationalism, Patriotism, and Radical Dissent featured Dread Scott – whose artwork figures prominently in The 8th Floor's current exhibition Revolution from Without... – in dialogue with fellow activist Joey Johnson and civil rights lawyer Ronald L. Kuby, moderated by Rubin Foundation Director Sara Reisman. The discussion reflected on the politics surrounding Scott's artwork What Is the Proper Way to Display a U.S. Flag?, and his activism with Johnson in response to the Flag Protection Act of 1989. The three panelists – Johnson, Kuby, and Scott – discussed their involvement in United States v. Eichman (1990), a landmark case on freedom of expression as it relates to desecration the flag, from the perspective of activist, lawyer, and artist. The discussion touched on art historical precedents of censorship as well as artwork involving the flag, asking whether a symbol of the state, like the U.S. flag, should be above critique. Gregory 'Joey' Johnson was the defendant in the U.S. Court case, Texas v Johnson (1989), that decided burning the American flag in protest is constitutionally protected speech. He is a member of the Revolution Club. Ron Kuby is a New York City based criminal defense and civil rights lawyer who has been practicing for 35 years. He began working with the great William M. Kunstler in 1982, and remained with him until his death in 1995. Throughout his practice, Mr. Kuby has done lots of cool and interesting stuff. He prides himself on being an irritant. Dread Scott is an interdisciplinary artist whose work is exhibited across the US and internationally. For three decades he has made work that encourages viewers to re-examine cohering ideals of American society. In 1989, the entire US Senate denounced and outlawed his artwork and President Bush declared it “disgraceful” because of its use of the American flag. His art has been exhibited/performed at MoMA/PS1, Pori Art Museum (Finland), BAM (Brooklyn), and galleries and street corners across the country. He is a recipient of a 2018 United States Artists Fellowship and grants from the Creative Capital Foundation and the Open Society Institute. His work is included in the collection of the Whitney Museum.